The Crescent Moon Kingdoms, land of djenn and ghuls, holy warriors and heretics, Khalifs and killers, is at boiling point. A power struggle between the iron-fisted Khalif and the mysterious master thief known as the Falcon Prince is reaching its climax. In the midst of this brewing rebellion, a series of brutal supernatural murders strikes at the heart of the Kingdoms. Only a handful of reluctant heroes can learn the truth, and stop the killing. Doctor Adoulla Makhslood just wants a quiet cup of tea. Three score and more years old, he has grown weary of hunting monsters and saving lives, and is more than ready to retire from his dangerous and demanding vocation. But when an old flame’s family is murdered, Adoulla is drawn back to the hunter’s path. Raseed bas Raseed, Adoulla’s young assistant, a hidebound holy warrior whose prowess is matched only by his piety, is eager to deliver God’s justice. Zamia Badawi has been gifted with the near-mythical power of the Lion-Shape, but shunned by her people for daring to take up a man’s title. She lives only to avenge her father’s death. Until she learns that Adoulla and his allies also hunt her father’s killer. Until she meets Raseed. When they learn that the murders and the Falcon Prince’s brewing revolution are connected, the companions must race against time to save the life of a vicious despot. In doing so they discover a plot for the Throne of the Crescent Moon that threatens to turn the city, and the world itself, into a blood-soaked ruin. The idea behind Throne of the Crescent Moon is great – an epic fantasy with middle-eastern roots featuring djenn, ghuls and royal vizier’s with mystical powers. I wanted this book to read like a darker Aladdin (naive I know, but I love Aladdin), something akin to One Thousand and One Arabian Nights, full of magic and intrigue. I got something so different, it’s a miracle I finished the book. It begins with the torture of a palace guard – a bloody and gruesome ordeal that had me geared up for a great tale. And then I met the lead characters. I don’t think I’ve ever gone from excited to bored so quickly. They’re stereotypical, utterly unoriginal – Adoulla is old and tired and wants to retire from his ghul-hunting days, but he’s never seen fit to train a successor and is now stuck doing it all himself, wheezing and stumbling along the way. Raseed, his assistant, is blindly devoted to religion and quotes religious texts at every opportunity he gets, and spends most his time rolling his eyes at his mentor’s antics and questioning his morals. If that wasn’t enough, they are soon joined by Zamia, a feisty shape changer hell-bent on revenge. She and Raseed fall in love at first bloody sight, for absolutely no reason, and spend the rest of the book sneaking glances and staring and generally making me nauseous. The plot is well thought out and relatively exciting. It’s not grand, not in the way I was expecting it to be, but was kept entertaining by the addition of two further characters, the husband and wife duo Dawoud and Litaz. Their function is to foil the original trio, to comment on their idiosyncrasies, make peace between them when needed, and generally be voices of reason, and I really believe that it’s only because of them that I finished the book. Litaz is my favourite character by far, straight forward and honest and a natural heroine. 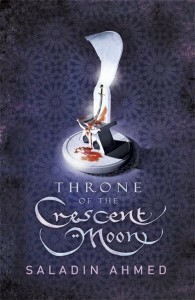 Adoulla stumbles into a dire plot to overthrow the ruler of the Crescent Moon Kingdoms, and although it’s always his intention to help out in whatever way he can, it feels like he is only really spurred into action because of his personal losses – his home, his friends and his relationships all suffer in the course of this adventure. He’s not really a reluctant hero, but more an accidental one: he ends up saving the world while pursuing his own revenge. It’s certainly different from the usual fantasy reads, and I quite liked it. While it’s refreshing to read a book set in the Middle East, and I wouldn’t have minded the author always reminding us of this fact in the way his characters addressed (giving peace) and greeted (cheek kissing) one another, I felt it was all too much. At under 300 pages Throne of the Crescent Moon isn’t exactly a long read, but it could have been between around 10% shorter if the characters weren’t constantly thanking, blessing or taking the name (in vain) of their God. There are less than ten pages in the narrative that do not have the word ‘God’ in them. It feels like their religious beliefs are constantly being flung into the reader’s face, and it’s quite frankly exhausting. I took the author’s examination of gender roles and masculinity in stride, seeing as the book is set in the Middle East and it would have been odd if he hadn’t, but I confess I balked when, in the midst of a battle, Litaz, an otherwise confident and capable woman, had this pearl of wisdom about herself: “She was a woman. God had not made her body for this“. I know I’m meant to then marvel at how Litaz got up and fought anyway, how she ended up being an integral part of the final battle, but it’s hard because, with those two lines, the author eroded away any progress he’d made by writing two strong (albeit stereotypical) female characters. I will freely admit that I didn’t like this book because of personal biases and expectations, and there are many who have loved the refreshing tale and its exotic setting. I wanted more from Throne of the Crescent Moon, however, and in my eyes it failed to deliver. Although I hope that the sequels are more to my liking, it’s looking unlikely that I will pick them up. I actually liked Throne, but the whole part with the body decomposing in olive oil was a little much for me. yucky. I actually kind of liked the torture parts and the gross imagery throughout the book. Take what you want from that :p Especially with the torture, I was just so intrigued and I wanted to know WHY he was being treated like that, and of course, when it was all made clear I was like o0o0o0hhhhhhh. I am loving the new cover for this, which I hadn’t seen before! I had some similar reactions to yours while reading this. I thought it was a little slow, and I was expecting something a bit different based on the official summary. It picked up most at the end, and I would have liked to see the rest of the book written with similar pacing. Unfortunately the author called me ethnocentric on Twitter because I didn’t like it. 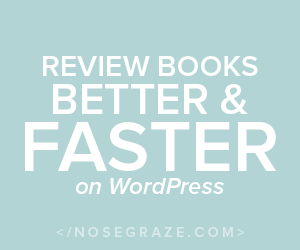 Having thought long and hard about my expectations, I realise I wanted the book to be something new and exciting, and I feel that the author hasn’t taken the usual tropes of the genre in any new directions. It’s basically a stock standard story with an exotic background, in my opinion, and although I love the idea, I feel like so much more could have been done with it, given the premise and the blurb. The romance, in particular, felt stunted and unnatural to me. I’ve been curious about this book since it was shortlisted so I’m glad to read a friend’s review. Sounds like one to put in the “don’t bother” box for me. You perfectly explained all the points why I didn’t like this book: Adoulla boring, too much mentioning of God etc. Maybe if I didn’t read so many glowing reviews and I started reading it with lower expectations, I would be less judgemental. But this way…. I don’t think I will bother to read the sequel.